A smart contract is a programmable set of terms that is capable of automatically enforcing itself upon the completion of pre-defined conditions through sensors and triggers. Smart contracts can be used to exchange money, property, shares, or anything else of value in a transparent and trustless manner, all while avoiding the services of a middleman. They are capable of executing complicated multi-party agreements beyond the capability of any singular organization, at a fraction of the cost and time. Automation, along with simple compliance and reporting reduces administration and service costs associated with lawyers, bookkeepers, accountants, and more. Trustless agreements – your documents are encrypted on a distributed, public ledger. There’s no way the information can be denied or altered. Cryptography, or the encryption of websites to prevent hacking and fraud, keeps your documents safe. Every block on the chain would need to be simultaneously hacked in order to even slightly alter it, a feat no hacker is capable of. Unparalleled accuracy that only digital processes can provide. The beauty of a smart contract is its simplicity. Rather than hiring a lawyer to create a contract for you and relying on a slow and tedious legal process to enforce the terms, a smart contract automates the entire process. In addition, all of the data surrounding the terms of the agreement remain in self-sovereign control – meaning that you control what parts of your data will be presented to the other party as well as the public. The digital nature of the transaction allows for streamlined transaction processes that can benefit anyone from startups to major corporations. These contracts are pieces of software that act based on external cues, so money is not released to any party until the terms are met and verified. The safety and assurance that comes with using smart contracts are what makes them so valuable. Next, we will look into how a smart contract actually works. Details of the contract (except for private information, such as bank info) are stored on the associated distributed ledger (private or consortium), and validated by validators. The smart contract connects with bank information and associated data and accounts, and places triggers to be activated by the completion of tasks. 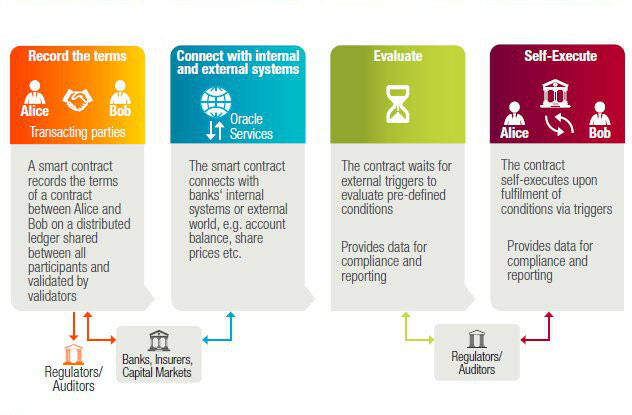 The contract waits for external triggers (completion of the task, data fulfillment, payment) to evaluate pre-defined conditions. Contract self-executes upon completion of pre-defined terms via triggers or sensors. Recently, there has been a debate on the integrity of automobile manufacturers, retailers, and the mileage their cars display compared to the actual total mileage they’ve accrued. According to a recent study, 30-40% of used car transactions involve cars that have had their odometers illegally adjusted. Smart contracts programmed into sensors within these vehicles would ensure that a certain “condition” (mileage) is met before any problems occur, and also would detect any attempts to manipulate the odometer. While it is continually asserted that our voting system is secure, the public still reserves its doubts. Implementing a smart contract architecture would ensure trustless elections – a system where trust is irrelevant due to the sensors and triggers that would detect any fraudulent activity. Ledger-protected votes would need to be decoded, and this requires more computing power than is currently available. In today’s world, businesses are subjected to a lot of paperwork, agreements, and waiting for internal or external issues to sort themselves out. This system leaves plenty of room for fraud and inefficiency, while smart contracts have the potential to create a streamlined business environment. The implementation of smart contracts in business management would also cut out discrepancies that typically occur with independent processing. The amount of paperwork, records, and fraud associated with medications, patient care, and patient management in healthcare is staggering. Sensitive information contained in health records could be encrypted and stored on the blockchain with an associated private key that grants selective access to those with permission. The same strategy could be used to ensure HIPAA laws (secure and confidential storage of private information) are always met, requiring private keys and self-sovereign data management. In addition, receipts for surgeries could be stored on a blockchain and automatically sent to insurance providers as proof-of-delivery to complete a smart contract. The ledger could also be used for general health care management. These complex processes currently in place are not cheap, and smart contracts would streamline healthcare and allow doctors to focus on the patient, rather than paperwork. Many technology researchers point to an incoming trend referred to as the “IoT’, or internet of things, as the next step of our technological evolution. The internet of things, simply put, is the transformation of any “thing” – be it a chair, car, or piece of equipment – into a digital system that includes sensors and attached smart contracts the sensors can communicate with. The IoT could transform your home into a smart home, where every aspect of it is “smart”. It could turn entire schools and cities smart, and allow for more trust, efficiency, and security in society than ever before. Smart contracts are the key tool that will allow this dream to be able to become reality. Smart contracts guarantee autonomy, trust, security, savings, and accuracy for each and every transaction they govern. They guarantee a very specific set of outcomes when entering into a deal, and there is no need for any litigation or third party to be paid to act as a mediator. While the development of the perfect smart contract has still not been achieved due to bugs and regulation issues, the future of these amazing pieces of software lies in unraveling these final obstacles. They have the potential to radically simplify and enhance the efficiency of any industry, and the only limit to their use is our own imagination. 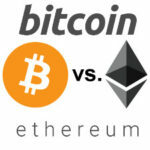 Will Bitcoin and Litecoin Ever Support Smart Contracts?